I wouldn’t be at the amusement park at all. These days I get my need for speed satisfied by sitting up too fast in bed. I get a dizzying high trying to remember why I’m in the room I’m in. And those coats? I’d be wearing all of them because I’m cold all the time! Almost every book I read has some element that makes me think that. For relationships, it’s Nora Roberts. For psychological thrillers, it’s Lisa Gardner, and for heart-pounding suspense, I enjoy Linda Castillo. I also love Dean Koontz, and that’s just to name a few. I was about eight or nine when I discovered Mille the Model comic books. It wasn’t long before I was writing my own adventures for the beautiful New York girl! I guess I’m a hybrid author only because I wrote a book that didn’t fit into my publisher’s guidelines and decided to put it up myself. Going forward, I believe I’m going to enjoy being a hybrid author. I’m ashamed to admit that I’ve never seen a Star Wars movie. I can say I’m fairly driven on and off a deadline. I had been writing short stories and poetry and getting enough rejections to wallpaper a room. I finally decided I’d had enough. I packed up my typewriter (yes, it was that long ago) and took it to the basement. Two days later I got a check in the mail for selling a poem. It was like a sign from God. I shouldn’t give up! That $8.00 check had me rushing back downstairs to get the typewriter. I was meant to be a writer! Mark Harmon – be still my heart! I can’t answer this. Through the years I’ve read so many books and met so many wonderful characters, it’s impossible for me to pick one. Definitely it was my husband. He encouraged me every step of the way to becoming a published author. Don’t own any designer purses, I’m definitely a bag-to-carry-my-junk type. I don’t belong to a critique group anymore, but I do belong to Mid-American Romance Authors and love the members who are so supportive and fun! Activities? What’s that? In the shower is where a lot of my book ideas pop into my head. Neither. Just give me good old rock and roll! Usually before, but there have been several books that I’ve written first and then written the synopsis afterward. I don’t care about an island, but I would like to hit the New York Times bestseller list again, and I’d definitely love to land a movie deal. Dillon didn’t plan it, but before he knew it, Cassie was in his arms. As she raised her face he captured her lips with his. She tasted of chocolate and raspberry and white-hot desire, and her body was invitingly warm against his. She curled into him as if wanting to get as close as possible. He stroked his hand through her springy, soft hair and deepened the kiss. He finally tore his mouth from hers and peered down at her. “Was that just another mistake?” she asked as she raised a finger to her lower lip. “I don’t know,” he confessed. Be sure to check out the next book in this exciting miniseries: Cowboys of Holiday Ranch – where sun, earth and hard work turn men into rugged cowboys…and irresistible heroes! 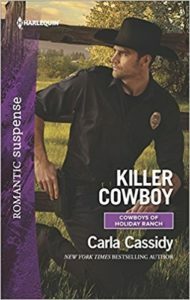 KILLER COWBOY, a June release from the Harlequin Romantic Suspense line and part of the Cowboys of Holiday Ranch series, may be purchased through these and other retailers: Amazon, Barnes & Noble, Books-A-Million and Harlequin. Carla Cassidy is an award-winning, New York Times bestselling author of over 150 books. 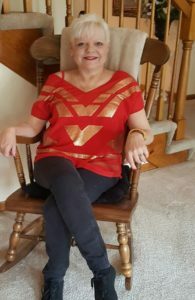 She loves Mexican food, reality television and writing stories to thrill and chill readers. Stay in touch with Carla through her website, www.carlacassidybooks.com, or through Facebook or Twitter. Loved your answers, Carla. Thanks for sharing your $8.00 check story. So glad you kept writing. Loralee, Thanks for coming here! I don’t know what I’d do without my writing. I swear it’s the only sanity in my life! Great answers. Looking forward to reading Dillon’s story! Thanks, Karen. The mystery of the Holiday Ranch and the seven skeletons are solved in this book…but that isn’t the end of the Cowboys of Holiday Ranch series! I just ordered this one, and now I wish I’d gotten the e-book so I could start reading tonight! And yeah . . . Mark Harmon . . .
Laura, LOL! I love Mark Harmon!! And thank you for ordering the book! I really appreciate it! I love your books and love you, too. Your support and encouragement have meant everything. Can’t wait to read Killer Cowboy. Cindy, thanks so much! You just keep writing and you’re going to get there!! Thanks for stopping by. There’s nothing worse than being on a blog where nobody comes to talk to you! I appreciate it! Carla you crack me up- If I can be half as good when I grow up- wait…strike that I refuse to grow up- when I am published I’ll be thankful. Am reading Countdown to justice series now, you rock lady!